The daughter of a Bangladeshi professor who was hacked to death in a murder echoing the killing of several secularists says he was not an atheist. So-called Islamic State (IS) said it was behind the death of Rezaul Karim Siddique, who was killed on Saturday. A statement from the militant group accused him of "calling to atheism". But his daughter Rizwana Hasin told the BBC that her father believed in God, and that she had no idea why he was targeted. "The investigators are investigating still, and we are still waiting to see the results," she said. "We still don't know what was the reason. Maybe [a] misunderstanding, maybe something else. It's still a maybe for me and it's still a maybe for my family." Siddique, 58, was a professor of English at Rajshahi University in the country's north-west. He was attacked with machetes as he left for work. He founded a music school and edited a literary magazine, his family said. Police believe he may have been targeted by extremists because he was involved in cultural activities. They have detained a member of an Islamist student organisation for questioning. Hardline Islamist groups dislike anyone involved in the cultural field, the BBC's Dhaka correspondent Akbar Hossain says. Bangladeshi authorities have rejected IS' claim to that attack, saying the organisation does not exist in the country. 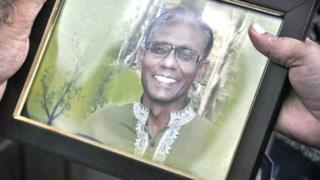 Siddique is the fourth professor at the university to be have been killed in recent years by suspected Islamists.